With the different ad schedules around Easter, I messed up my regular update of the price comparison list, but I am finally back on track. I finally made my way through Winn-Dixie to get Winn-Dixie's prices added to the grocery price list. The prices keep on going up and up and up...., and a gallon of milk is now $2.09 at Aldi in South Florida, but but but at Publix it is $3.75, at Target it is $3.34 and at Winn-Dixie it is $3.45. Zucchini is finally becoming affordable at Aldi at 24 oz of Zucchini for $1.59. I already had some zucchini at home that needed to be used, but I still wanted to share this tasty Zucchini Latkes recipe. Aldi is the place for bargains, but quite often the best way to save at Aldi is through unadvertised bargains. My local South Florida Aldi store had ripe bananas on BOGO sale. Yes, you read that right. A BOGO sale at Aldi. Keep in mind that these were ripe bananas, but still at $0.22/lb they would be great for baking. I seriously considered picking some up for banana bread, but I knew they would have to be used that same day or the next, and baking banana bread just could not fit into my schedule. This week I also found of in-store Aldi markdowns on ground beef. Not good enough for me to pick it up, since I still have ground beef in the freezer, but still at a great per pound price. Wow, even the Aldi milk price has gone up, and no prices other than the produce deals seem to have gone down this week. This afternoon I went on my weekly Aldi shopping trip, and just the price of milk is worth it....of course, the milk has now gone up to $2.09, but it still cost less than 1/2 gallon of milk at Publix or Target. The Aldi strawberries were on sale at $1.59 this week, but it was a different sort and brand that our Aldi usually have, and the strawberries just did not look as great. They were fresh, but the color was very light, they were too big, and I they did not have that real strawberry taste, which I am always looking for when picking the right strawberries. I was hoping to be able to pick up some Easter goodies on clearance today, but there was no Easter Clearance. There were some jelly beans and gummi candy left, but it rang up at full price. Even the Easter sprinkles and the Easter cupcake mix was listed at full price, and everything else was gone. Has anyone else had any luck with finding Aldi Easter Clearance? Aldi South Florida Produce Prices Starting Wednesday 4/27- Yeah Avocado and Mango Sale! I am excited to see that Aldi has Avocados and Mangoes on sale in South Florida this week. Our mango season is usually in Junie - July, but amazingly we have already had our first ripe mango - which should tell you how hot it has been down here this year. Despite having several avocado trees, none of them are ready to bear fruit yet....but in a couple of years we will hopefully be having lots of great tasting homegrown guacamole. Come check out the new produce prices that Aldi in South Florida has this week. The Aldi Garden Starter Pack Giveaway ended last night, and I want the winner to get started on his or her garden as fast as possible, so.... let's find that winner. The Garden Starter Pack giveaway here at the Aldi Spot ends tonight, so I wanted to remind all of you to get your entries in. It is a low entry giveaway, so your chances for winning are great, especially if you take advantage of the bonus entries. Here in South Florida we are at the peak of the tomato season, and I love being able to go outdoors and pick my own vegetables. I hope this garden starter pack will help an Aldi Spot reader get his or her garden started. The Garden Starter Pack giveaway has low entries, and it ends tonight at 10 PM EST. 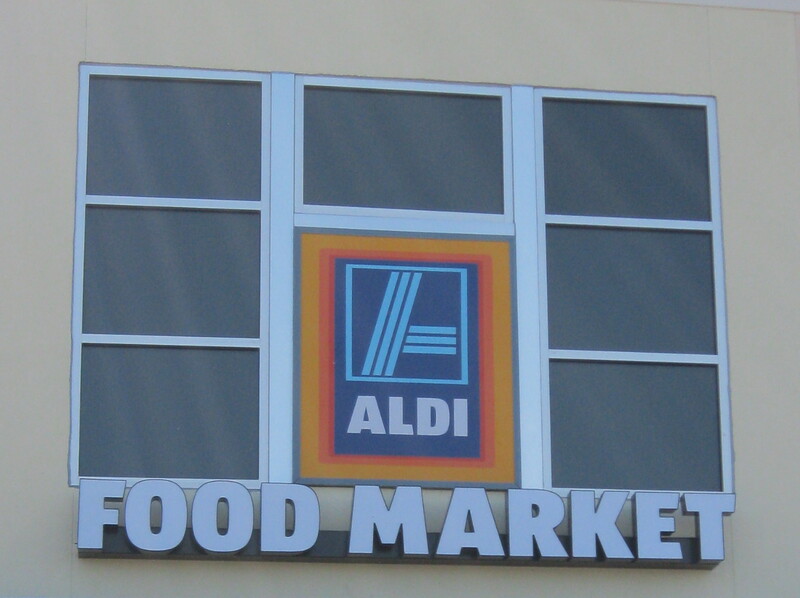 Although Aldi is closed today, so the new Aldi ad will be still starting tomorrow Monday 4/25 for some of you. Before I dive into the new Aldi Ad I would like to wish all of you and your families a Happy Easter. 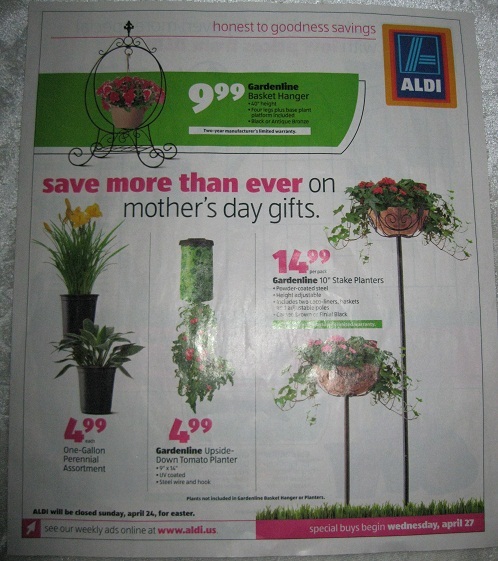 Aldi continues it great garden sale, and there are some great prices on Gardenline products this week. This week I discovered Aldi price increases on some of my favorite Aldi products, but fortunately I also uncovered some price decreases. I am a bit worried about the price increases on baking goods though, as this was one of the main attractions of Aldi. Hopefully, the prices will eventually go down again, and I was relieved to see that the flour tortillas were still at $0.99 and a gallon of milk at $1.99. The stores are keeping me busy updating the price comparison list, as the price increases seems to continue this week, but at least there were a few decreases at Aldi this week as well. I actually found eggs cheaper at Target this week, since they are on sale at $1.19, compared to our South Florida Aldi price of $1.29. Of course some of you have lucked out with Aldi egg prices at $0.79 this week. I don't know about you, but I am thankful that Aldi keeps milk prices at $1.99 here in South Florida, and I sure hope it stays there, as the competitors are moving closer to $3.50.